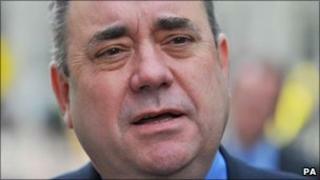 Scotland would "gain little" by full independence, a key economic adviser to First Minister Alex Salmond has warned. Professor John Kay said that while the move would "clearly be economically viable", increased financial power within the Union was more likely. The Scottish government will hold an independence referendum in the second half of the new Scottish Parliament. The SNP said Prof Kay was appointed to the council of economic advisers on the basis of his expertise and record. The Scottish budget is currently funded through a block grant from Westminster. But Mr Salmond has used the SNP's landslide election win to call for more financial powers for Holyrood - namely increased borrowing powers, corporation tax, excise duties and control over the Crown Estate. Prof Kay, who was appointed to Mr Salmond's council of economic advisers (CEA) after it was created during the last parliament, said independence would bring political and economic complications. Writing in the Scotland on Sunday newspaper, he stated: "The reality is that Scotland would gain little by full independence. "In the modern world, economic sovereignty for small nations is inescapably limited, and political sovereignty is largely symbolic. "There is very little possible autonomy for Scotland which is not potentially available to it as part of the United Kingdom." Prof Kay argued that, while Scotland was the most prosperous part of the UK outside southeast England, there were "wide disparities" within its economy. "An independent Scotland would clearly be economically viable," he wrote, adding: "But whether Scotland, the remainder of the UK - or both - would be better off after separation is much less certain. "In the short run, that would depend on transfers and subsidies to the Scottish government from the rest of the UK. "In the long run, the issue is whether independence would promote economic dynamism in Scotland - or lead it to sink into the partisan petty corruption that, for so long, characterised Scottish politics." Prof Kay went on to argue the SNP's claim on revenue from the vast wealth of North Sea oil was "not straightforward", adding that offshore wind power was "inherently unprofitable". "Standard principles of territorial allocation would give much of the North Sea and its tax revenues to Scotland," he said. "Yet the historic privileges of the monarch mean that offshore energy is largely a UK resource." The economist said there was "virtually no chance" that a referendum would support independence, saying the likely outcome would be greater fiscal autonomy. "Scotland can get many of the advantages claimed for independence if it negotiates for more autonomy, while still staying part of the Union," said Prof Kay. A spokesman for the first minister, said: "John Kay, along with the other members of the CEA who served in the last session, was appointed on the basis of his record as a globally respected economist, not because of any party political affiliations. "The CEA was made up of a mix of economists, some of whom, like John Kay, believe in financial autonomy for Scotland, and others who support independence. "The one thing they all agree on is the need for Scotland to gain substantially more economic powers, and, as John Kay himself says, an independent Scotland is a perfectly viable economic prospect." The UK government has said it would not stand in the way of a referendum, but Prime Minister David Cameron has pledged to campaign strongly against independence.